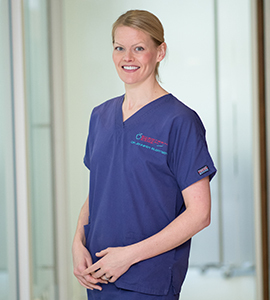 Dr. Jennifer Eilertsen graduated from the University of Dundee in 2009 having already completed an honours degree in Human Anatomy. Having completed the MJDF, she is a member of the joint Faculty of General Dental Practice and the Royal College of Surgeons of England. Jennifer is most interested in cosmetic and Implant dentistry. She recently became the second lady in Scotland to complete the prestigious Diploma in Implant dentistry with the Royal College of Surgeons of England, a rigorous 2-4 year programme based in London-the gold standard qualification in this field held by only a handful of clinicians in the country. Jennifer has also trained in facial aesthetics, to provide ‘Six Month Smiles’ cosmetic braces and holds a post graduate certificate in Sedation with the Eastman Dental Institute. This provides the perfect adjunct for implant dentistry and is also very helpful for any nervous patients. Outwith work, Jennifer loves triathlon. She became hooked on fitting this in around her career when she won the age group sprint distance world championships in Vancouver during her elective at university. She treats her triathlon with the same dedication and attention to detail as her dentistry and says the two things can compliment each other as require such different skill. She has competed across the distances now and helps to run her husbands locally based club and race team at the weekends.